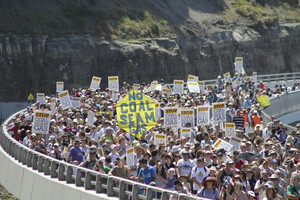 Three thousand people marched over the Seacliff Bridge near Clifton against coal seam gas mining on October 16. PHOTO: Michael O’Brien/Stop CSG Illawarra. IN December last year the NSW Government revived the plan for coal seam gas (CSG) in catchments; recommending approval of Apex Energy’s application to keep alive a 16 well projects in and around the Woronora and Upper Nepean drinking water catchments. Tomorrow the NSW Planning Assessment Commission will host a public meeting to hear views on this recommendation, before deciding the fate of Apex’s project. Twelve organisations – including Wollongong City Council, Illawarra Local Aboriginal Land Council, Public Health Association of Australia, Stop CSG Illawarra and Magnum Gas and Power – and 20 individuals, will address the Commission. Stop CSG Illawarra spokesperson Jess Moore said the Government’s recommendation was grave news for all who get their water from the Sydney Water Catchment. “It flew in the face of the Premiers’ pre-election promise to rule out mining in the drinking water catchment. It flew in the face of common-sense,” Ms Moore said. “Eleven of the 16 wells are in areas so protected that I can be fined up to $44,000 for walking there. “CSG exploration and mining always involves unearthing water that is high in salt and methane, and can contain toxic and radioactive compounds and heavy metals. “The risks are not theoretical; heavy metals and toxins have contaminated soil and water, CSG sites have leaked methane and fracking chemicals have spewed into the air. “Community opposition in the Illawarra is enormous. The PAC needs to know this. And they need to know that this community will not let CSG development in the drinking water catchment go ahead, whatever they decide. “It is revolting that we have to fight our Government to have our drinking water protected; but fight we will.